Another of these mopping-up FO posts. 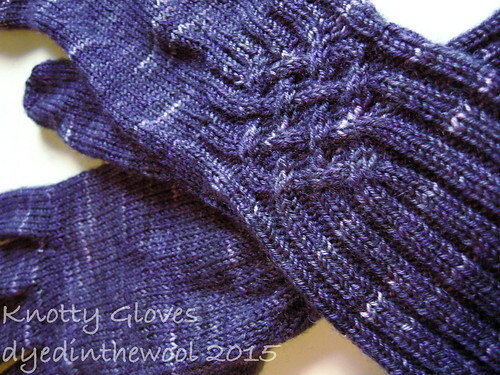 Yarn: Krafty Koala BFL Nylon Sock Yarn in Midnight Tempest. Unknown yardage, probably used 60% of the skein. The colour of the yarn is really difficult to capture! Dates: 1st February 2009 (!!!!!!!) – Some time late 2013 to early 2014. There may be some accidental modifications involving the cables, but we’re not talking about those. 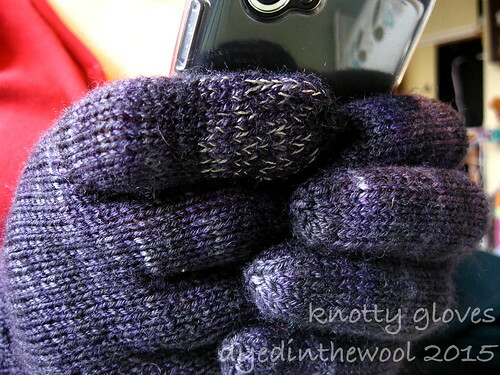 These are very comfortable to wear and the cable on the back of the wrist is a really clever way of bringing the glove in without including any shaping. Incorporated some of that conductive thread in the index finger of the right hand glove for operating of fancy schmancy touch-screen stuff. Ideal for paying for your tram ticket without having to take of your glove!